The Patriots defeated the Colts, 45-7, on Sunday night to earn their eighth Super Bowl appearance in franchise history. The next day, the NFL confirmed it was investigating whether the team used underinflated footballs. The Colts reportedly grew suspicious after linebacker D’Qwell Jackson intercepted Tom Brady late in the second quarter. A softer football is easier to throw and catch, especially in rainy conditions, as was the case Sunday night. According to Newsday, Jackson gave the ball to a member of the Colts’ equipment staff, who notified coach Chuck Pagano, who then relayed a message to general manager Ryan Grigson in the press box. He contacted Mike Kensil, NFL director of football operations, who then told the on-field officials at halftime. At least one official touches the football on every play, yet none seemed to notice until halftime. The Patriots led, 17-7, at intermission, and outscored the Colts, 28-0, after the officials seemingly corrected the ball issue. 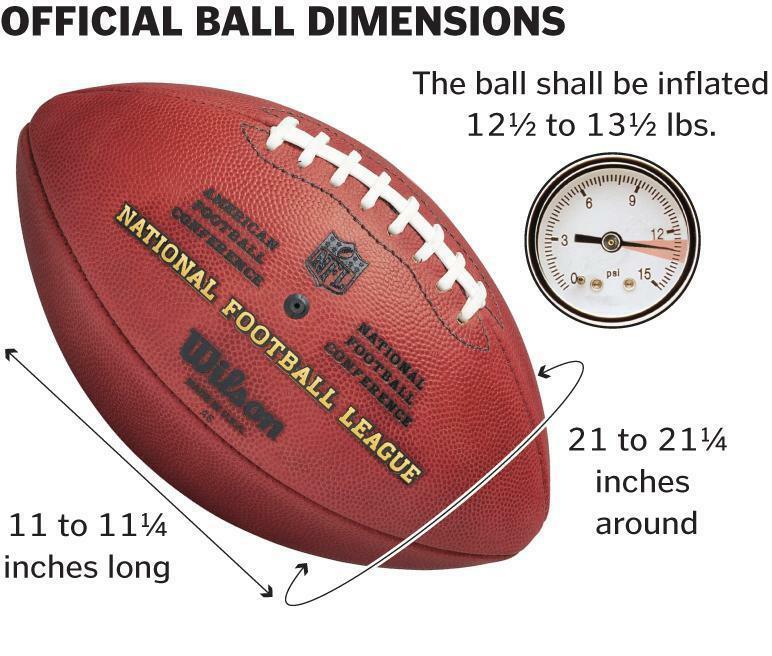 Per the NFL rulebook, each team provides game officials with 12 footballs before the game, and the balls are required to be inflated between 12½ and 13½ pounds per square inch. The referee inspects the game balls 2 hours and 15 minutes before kickoff, places a special marking on each ball that passes inspection, and hands the approved balls to attendants on each team, who are supposed to maintain custody of the balls on each sideline. Each team uses its own football on offense — a 2013 New York Times article said that each team even has its own logo on the football when on offense — and teams are allowed to slightly doctor the footballs to their preference. “Rubbing up” the football with dirt to make it less slippery is common, and so is slightly adjusting the inflation levels. Packers quarterback Aaron Rodgers likes to overinflate the football. When the Packers and Patriots played on Nov. 30, CBS broadcaster Phil Simms relayed a conversation he had with Rodgers. Rodgers defended the practice Tuesday on his radio show on ESPN Milwaukee. “It’s not an advantage when you have a football that’s inflated more than average air pressure. We’re not kicking these footballs,” he said. It’s unclear how often the NFL investigates ball issues. In another incident this season, the NFL reminded all 32 teams that they cannot warm the balls with sideline heaters during cold games, after the Panthers and Vikings did it in their Nov. 30 game in Minneapolis, drawing a warning from officials. “If something is noticed, it’s not unheard of for a ball to be removed from circulation and then tested during the week for whatever issue there was,” head of officiating Dean Blandino said. Post by The Boston Globe.